Take one bowl, add maida, salt, red chilly powder, garam masala, chaat masala and mix well. add paneer pieces and roll in maida mixture. put in freeze for 1 hour. After 1 hour deep fry it . Take one pan and heat butter. Add chopped garlic and saute for 1/2 minute. add tomato ketchup,red chilly sauce,vinegar and mix well. add 1 or 2 tablespoons water and cook for 1/2 minute.add spring onions and switch off the flame. 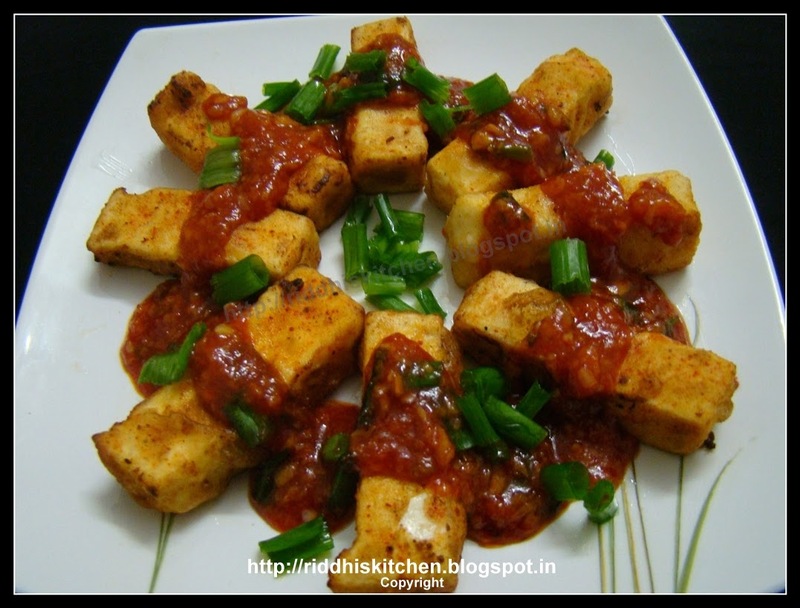 Take one plate and arrange paneer pieces and pour sauce and garnish with spring onions .